EBN Woodworks – Engineered By Nature. Crafted With Precision. Engineered By Nature. Crafted With Precision. Why Boring Furniture Makes You Boring (and 3 Tips for Being Stylishly Un-boring). If you pride yourself on having a unique personal style, then why is your furniture so dull and boring? It would be highly awkward if we all walked around in the same clothes, yet I’m sure I can describe to a tee the average American’s (boring) furniture sight unseen. Why Cookie-Cutter Is A Problem. Color meets color. While we love the allure and quality that a solid walnut finish does for our high quality furniture, we especially love to add character by creating geometric multi-stain finishes to certain pieces. Color doesn’t have to be garish. By using multiple stains, we create texture and a fresh take without being too cheeky. This table incorporates fresh color that gives it a vibrant feel that is un-boring and inspired. Shape Shift. Yes, a bookcase will have a universal shape so that it can indeed hold your books but there’s still opportunity to add more drama to the same old same old. Add a twist to traditional pieces with curved edges and enhancements to functionality. This bookcase is a fresh take on an old piece. Rather than create a traditional vertical piece, this slanted orientation creates an un-boring aesthetic. Old Meets New. There’s a need for furniture that complements our growing technological penchants. Rather than purchase cheap accessories for your phones, and tablets that don’t lend itself to high quality , purchase high quality wood accessories. These accessories are sure to inspire guests and you’ll never be accused of having dull taste. This bluetooth radio is a slick take on a concept that isn’t new. 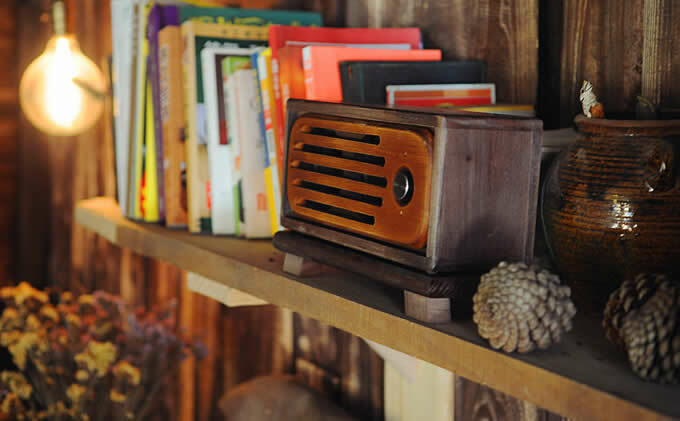 Rather than purchasing the typical boring plastic piece, invest in a wooden radio that adds a nice flair to your home. Let Your Decorative Style Be An Extension of Your Personal Style. Whether you’re a lover of traditional furniture or you prefer the funky flair of modern design, strive to add depth and interest to those items. You’re interesting and fun… why not have furniture that’s just as quirky? If you’re having a hard time finding pieces that inspire your creative side check out the EBN Woodworks gallery on Etsy. While there is nothing wrong with purchasing starter pieces, there will come a time when you’re ready to trade in those Ikea pieces and graduate to the next step. We’ve identified 3 easy tips to help you source the best pieces for your home. TIP ONE: Look outside of the box(stores). Here’s a riddle, “If most furniture is cheaply made, where can I find high quality wood furniture (without spending an arm and a leg)? At the outset of your search we suggest looking into your local Craigslist, Goodwill, and antique stores. While we know some aren’t fund of the idea of buying any used items, here’s our rationale: Most retailers don’t carry new furniture that matches the quality of furniture manufactured 20+ years ago (not even 10 years ago). A clever, and financially savvy way, to get around this is to source furniture from a local Goodwill then swap out hardware, re-stain and enjoy a high quality piece, that with a little elbow grease, outshines its contemporaries. Be on the lookout for tale-tale signs of poor craftsmanship and low quality— large furniture that is lightweight, has poor joints, and furniture that lacks solid wood pieces. Most retailers sell entry-level furniture that is particle board covered with veneer. Solid pieces are a better alternative for your furniture as they tend to last longer and hold up against heavy use. Pieces that are of higher quality will have dovetail joints, metal hardware (brass as opposed to high-grade plastic), and be fairly heavy to lift. TIP THREE: Slow and Steady Wins. Don’t rush. Sure, no one wants their home to be virtually empty when guests arrive but everyone understands that sourcing furniture takes time (and money). While you save up and continue to search for high quality wood furniture, buy reasonably priced furniture to tide you over but DON’T feel compelled to fill every section of your house with poorly made furniture just so your home doesn’t seem empty. Think about the many pieces of furniture you’ve purchased over the years that have fallen apart from heavy usage and moving. Outfitting your home will take time. Think quality not quantity. BONUS TIP: Stay Connected With Manufacturers. The best opportunities tend to show up when you’re not looking for them. Connect with local furniture stores and manufacturers, like EBN Woodworks, via social media to be aware of the latest trends in furniture. EBN Woodworks creates custom pieces for people across the U.S. and is constantly thinking of new takes on old things so be sure to connect with us via Instagram for the latest in high quality wood furniture. FOOD FOR THOUGHT: We Stand On Quality. Here’s our question to you: Do you trust the quality of any of your furniture enough to sit or stand on it? If not, you’ll be in the market for high quality wood furniture soon enough. Here at EBN Woodworks, we’re more than willing to sit on (and stand on) our furniture. EBN guarantees quality craftsmanship every time all the time. EBN Woodworks manufactures high-quality custom pieces for homes across the U.S.
*** All of our furniture and accessories are on Etsy.